Dust canï¿½t escape the long arm of the Vac N Blo! Upgrade your Metro Vac N Blo vacuum with this optional 6 ft. hose! The hose features durable, flexible construction. The hose doubles the reach of your Metro Vac N Blo when combined with the vacuumï¿½s included 6 ft. hose. Reach under car seats, into trunks, and into all the nooks and crannies of your vehicle with Vac N Blo 6 ft. hose attachment. The Metro Vac N Blo 6 ft. Hose works with the Wall Mount Vac N Blo Sr. and the Vac N Blo Portable Vacuum. 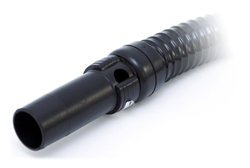 This hose attaches to both vacuumsï¿½ existing hoses. Every hose has a power control at one end to control the flow of air. Extend your reach with the Vac N Blo 6 Ft. Hose! The hose allows you to adjust the flow of air with the Power Control. Save $4.99 when you buy two hoses! Connect two hoses to make one extra long, 12 ft hose. Have the MetroVac Handheld Car Vacuum and despite it being so small, it was definitely a bit difficult to maneuver within the cockpit of my RCF. This small 6ft Hose simply attaches to the end of the canister and now enables me to leave the actual Unit (Canister) on the ground while using this hose to get into every nook n cranny! Shame it doesnt come WITH the purchase of one, but regardless - Mission Complete!! Best hose that I have ever used. Only little too short. My suggestis to get the one with 30 ft , I bought 30 ft extension and added this 10 ft ,now it's perfect. The six foot hose should have came with the vacuum. 3 feet is a joke.